A gemological refractometer is designed to identify gemstones. Our gemological refractometer RF 5381 is calibrated at a constant temperature of 20 °C. In general refractometers are used to identify solid or liquid material or to measure the concentration of liquids. 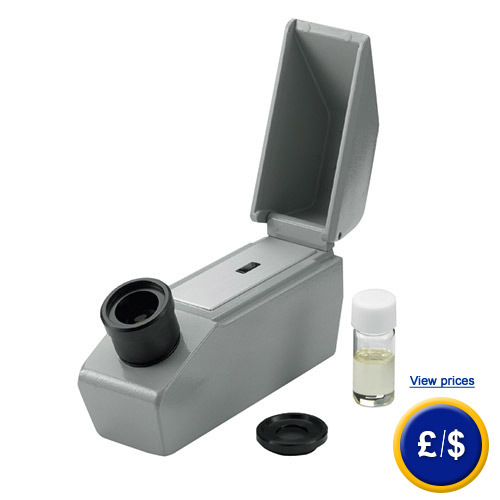 Therefore the refractometer can be used as a mobile station. The gemological refractometer is portable, but it should be preferably operated positioned on a table. If there are any questions about this gemological refractometer RF 5381, please have a look at the technical specification below or call: UK customers +44(0) 23 809 870 30 / US customers +1-410-387-7703. Our technicians and engineers will gladly advise you in all refractometers and all products in the field of measuring instruments, regulation and control and scales. - Measurement range 1.3 ... 1.81 R.I.